Happy Easter! On Friday, I was refilling the bird feeder when I saw how beautiful our tulip tree was and went back inside for a camera. Funny, a couple of years ago I was ready to pull it up. 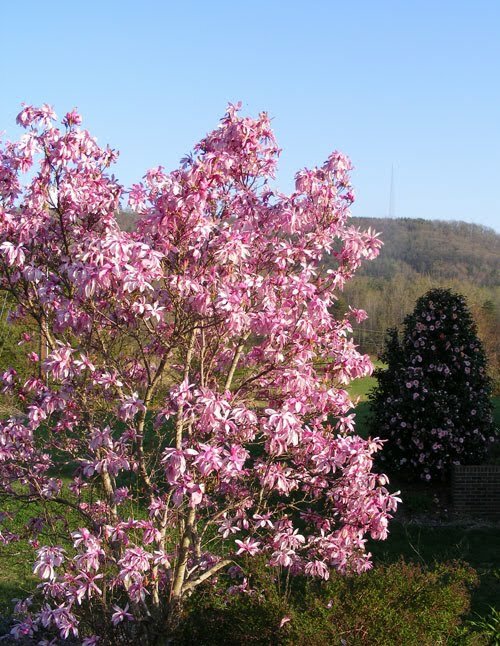 For the back corner, the nursery owner recommended a tulip tree. "It has big pink blossums every spring," he says. That sounded fine to us; everything else he suggested looked and grew just great. What he didn't say was that you get the bloom early before the leaves. After the leaves it is just a regular tree. There are other trees like it - a dogwood for example flowers before the leaves come out. But for some reason, I've always found this tulip an ugly tree. The blossoms look so empty on the sprawling limbs all alone. We ought to trim it up, but I keep thinking we will just rip it up instead. That is until this spring, it really is full and beautiful even without leaves. I'm not sure if there is a moral to this story. Maybe the tree is trying to teach me patience. Many people think I could use some. I keep telling my husband - who has the patience of 12 saints - that patience is NOT a virtue. 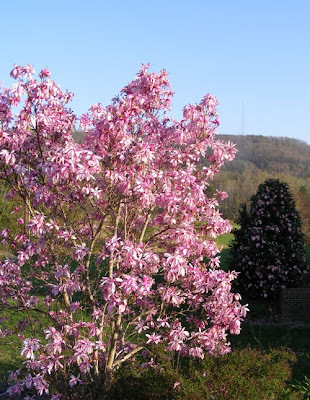 But maybe the tulip tree is proving me wrong.